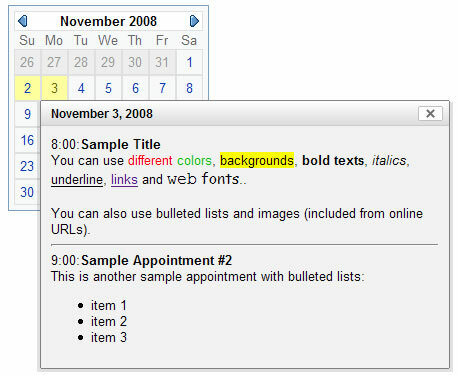 High interactivity: The floating panels are closed automatically when the mouse leaves the calendar's area and the floating panels area. Supports 12-hour clock and 24-hour clock. Important: Note that this special version is sold as a separate extension. However if you have purchased previously the standard Appointment Calendar please contact us and we will provide you with an upgrade link for the price difference. Be sure to include the email address used for the previous purchase in your contact message. Img.1 - Additional formatting in the public site. 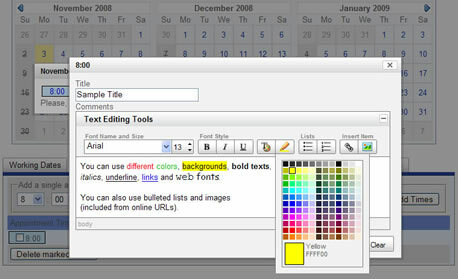 Img.2 - HTML (WYSIWYG) Editor available in the admin area. It's necessary to set writing permissions to the folder "TDE_AppCalendar/admin/database" where the data will be saved to. You can consult our FAQ if you are not sure how to proceed. Note: This product does not require external database systems; the information is kept in text files in a folder on your website. This way the technical requirements are low while the installation and use are kept simple and straightforward. Note**: We have a similar product named "Daily Scheduler Calendar" that allows to select time intervals for the appointment among other additional features and configuration options. Note***: This product uses plain text files to store the information. If you are looking for a product based on MySQL databases then check the Appointment Calendar with MySQL Databases. The sample, installation instructions, video tutorial/demo and extended information are present in the standard Appointment Calendar page. 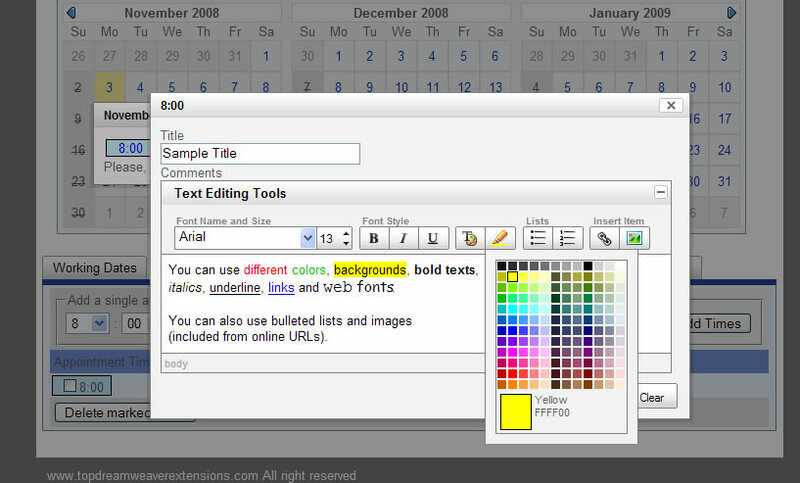 Additional Info: Appointment Calendar with HTML Editor - Online FAQ. Tip: To change the 24-hour clock to 12-hour clock go to the file "TDEAppCalendar.js", find the setting mCfg.MILITARY_TIME = 1; in the first lines and change it to 0 to use a 12-hour clock. You will find other useful settings on that file (start weekday, date delimiters, month/day position, ...).